Editor's Note: I am quite fond of much of what I wrote on my old blog, but none of it is public anymore. Being the narcissist that I am at times, I've decided to reprint some of my old favorites that fit the spirit of this new enterprise. This post was first published last August. I chose it because my wife and I are leaving tomorrow for Nebraska. Tomorrow my wife and I are taking off to visit my family in my home state of Nebraska. I'm from a town of about 24,000 in the south-central part of the state, two and a half hours west of the nearest major airport in Omaha. (Here's a clue, we'll be there for the Kool-Aid Days festival.) Although I am extremely happy to see my parents, sisters, niece, nephew, cousins, aunts, uncles, and grandma again (we're having a big ole jamboree), every time I go back the place seems more and more foreign to me. In fact, if my family wasn't there, I'd probably never go back to my home town ever again. It was a great place to be for a young child. It's always been a rather civic-minded community, which meant lots of public parks and pools to play in, a well-stocked public library to learn in, and a quality public school education. I also had the good fortune to come from a very close and loving home, so life inside the house was about as happy as it could be. Unfortunately, I couldn't stay at home all the time, no matter how hard I tried. The cracks in the idyllic veneer of my childhood started with my first day of school. For my kindergarten and first grade years my parents sent me to a wretched Catholic school that has given me a permanent fear of authority figures. My kindergarten teacher was an abusive tyrant who once threatened to shove my socks down my throat for the crime of looking out the window. When one girl was unable to tie her shoes, the teacher shoved her right into a desk, causing a frightening flow of blood from her nose. I will carry the image of that little girl's white blouse covered in her own blood in my head until the day I die. This same teacher also had me taken out of class one day and tested for mental disability. I'd love to mail her a copy of my PhD diploma. At public school I tended to get along fairly well with my teachers, many of whom encouraged my creativity and intellectual curiousity. My main problems came from my peers, who saw me as an easy mark for bullying, teasing, and public mockery. I was literally spat upon, depantsed, and once had a whole bottle of cologne dumped on me. The thing that kept me going in my teen years was the knowledge that there was a wider world out there beyond rural Nebraska where I might gain acceptance. A world where other people read Kerouac, listened to the Smiths, and appreciated movies like Taxi Driver. A world where I might be able to have friends and get a date. My high school graduation was one of the happiest days of my life, beccause I knew I would finally be escaping from a place where I had never been accepted. As is usual for young people of my disposition, I found my tribe of fellow nerds in college and never looked back. After college I moved to Chicago for a couple of years, and then went on to get my PhD. During the years after I left home I took four trips abroad, including one nine-month stint in Germany. By the time all was said and done I'd washed most of my upbringing off: I had become a social democratic agnostic cosmopolitan with highfallutin' tastes in culture and food. Like other academics who come from non-academic and non-bourgeois backgrounds, a gulf of experience has widened between me and my family. Most of my family has stayed within The Bubble. They live in rural Nebraska and Kansas, go to Catholic Mass every week, vote Republican, think of Omaha as "the big city," and are frightened of ethnic food. As economic life in rural America has gotten ever cruddier, its residents adhere that much stronger to the ethos of The Bubble. Nobody wants to admit it, but when Barack Obama said that people in rural America were responding to hard times and negative change by "clinging to guns and religion," he was right on the money. I've seen it in my own family. My parents have become more radical in their Catholicism, and more unhinged in their politics. In addition to taking part in anti-abortion protests and spouting Tea Party talking points, they were part of a local campaign to prevent water flouridation. Whenever I go home, I never cease to be astounded at how narrow peoples' horizons are; it's as if life does not exist in the world beyond a hundred mile radius surrounding rural Nebraska. Chicago might as well be the moon, forget about California or New York. 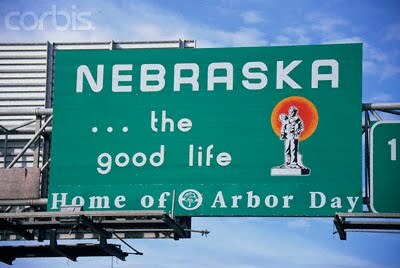 I don't want to dislike the place where I was born and raised, but it never seemed to like me very much to begin with. (At least it now has a good bakery and coffee house.) I can at least take heart in seeing the loved ones who are all I really cherish from those days, days that now seem like they happened in another life. When I was seventeen years old, I read a book that grabbed hold of me like none had before, and few have since: Fyodor Dostoevsky's novella Notes From Underground. I was a very lonely teenager living in an isolated town with few friends, but lucky enough to have a philosophy major at the local college as an intellectual mentor. He told me about existentialism (he was nuts for it), and when I asked where I should start reading, he pointed me in Dostoevsky's direction. I picked up the book at the University of Nebraska Bookstore while I was in Lincoln for a summer program. That edition was a cheap Bantam paperback, which luckily had extensive footnotes to give me historical context for the references in the rants of the Underground Man. I loved it so much that I had one of my senior pictures taken holding it, and I used a quotation from it as my senior quote: "One's own free unfettered choice, one's own caprice, however wild it may be, one's own fancy worked up at times to frenzy--is that very "most advantageous advantage" which we have overlooked, which comes under no classification and against which all systems and theories are continually being shattered to atoms." If you haven't read a book, here's a quick synopsis. An early middle-aged low-level civil servant rants about things that bug him, from his toothache to philosophical utilitarianism. He works against the grain of his times, and lives a solitary life in obscure circumstances "underground." He then tells the story of his descent underground when he was a young man on a night of wet snow. He intentionally crashes the party of some old schoolmates who loathe him, and then establishes what might be the beginnings of a love relationship with a prostitute who is similarly lonely, before he intentionally stands her up to burrow into his underground hovel, unable to foster a true human connection. This does not sound like the kind of thing the average teenager would enjoy, but I was not the average teenager, but a bit of a freak who was too dorky for the arty crowd and too well read in Camus, Nietzsche, Kafka, Burroughs and Kerouac (rather than comic books and Dungeon Master's guides) for the nerd crowd. I too thought that I was a man out of time, and felt a certain kinship with the Underground Man, despite his sometimes perplexing and aggravating personality. That book remains a big inspiration for me, and one of the ideas behind my new blog, which I hope rises like a phoenix from the ashes of the old. I aim to write essays rather than reports, grand polemics rather than rants, to be a man out of time yet again and imitate the venerable tradition of belles lettres in the online format. As an expert in the history of 19th century Europe, that seems the most fitting form for me to work in. My new residence in the Ironbound neighborhood of Newark, New Jersey, has also inspired this change. In many ways I live in a place that is more like a foreign country than America, and a place where I don't quite fit in. It is a neighborhood dominated by immigrants from Brazil, Portugal, Spain (specifically Galicia), Mexico, and Ecuador, and so a very tall, pale, ginger-haired guy like myself sticks out like a sore thumb. It is actually liberating, since for the first time in my life I feel no pressure to fit in because there is no way I ever will. I also just love the place, from the smell of Brazilian barbecue wafting in the streets to the fact that I can run my errands on foot. For this place is a place out of sync with the rest of America in so many ways. There are almost no chain restaurants to speak of, people have a certain dignity in their manners lacking in most native-born Americans, and folks lend a hand without a second thought. I still remember last winter when I was visiting my wife, and her car was covered by a snow drift after a blizzard and I had to dig the thing out with only a garden shovel (long story). The guy digging out the cafe next to the car saw this, helped me out a little, and then lent me his snow shovel so it would be easier for me. Living in this place, where I often feel like foreigner, has the potential to help me unfetter my mind and see things from a more rarified perspective. I do feel a little bit like I have gone underground, that I am living in a place where a person like me is not supposed to live. I also think that I have subconsciously decided to avoid at all costs the vulgarity of mainstream American society. My wife and I have talked about leaving the Ironbound so we can buy a house, but right now I have a hard time wanting to get out of this place, since it seems to suit me so well. Unlike the Underground Man, I am relaxed, happy, and married to the love of my life. I'm ready to give up childish things, like my bitterness towards academia and my adolescent rages, and let my muse, rather than my spleen, do more of the talking. I hope you like the results. Now that I've moved to New Jersey permanently, and have taken on a new career, I junked my old blog and started this one. My last was rather unfocused, this will be better focused, but I am not sure how just yet. In any case, I'll give my old loyal readers some time to catch up and find me.